Planning Sentinel-1 acquisitions over Hurricanes to provide better measurements and monitoring of extreme wind conditions from space. A subset of products from the Copernicus Sentinel-1A spacecraft launched in April 2014, highlighting the capabilities of SAR imagery to capture valuable information for land, marine, atmosphere, emergency management and security applications. 10 meter SAR-based wind products from CLS operational receiving VIGISAT station - High resolution vision for Meteorological, Renewable Energies and Offshore applications. The first observation-based swell model using Synthetic Aperture Radar measurements: analysis and forecast for assimilation in Numerical Waves Models. Long time series of high resolution wind measurements from Radar satellites – Wind regime classification and resource assessment over wide coastal regions in a snap. SAR capabilities for the high resolution characterization of wind wakes from offshore wind farms - Towards the optimization of wind farm installation. A dissemination platform for the next generation of satellite-based oil detection service. 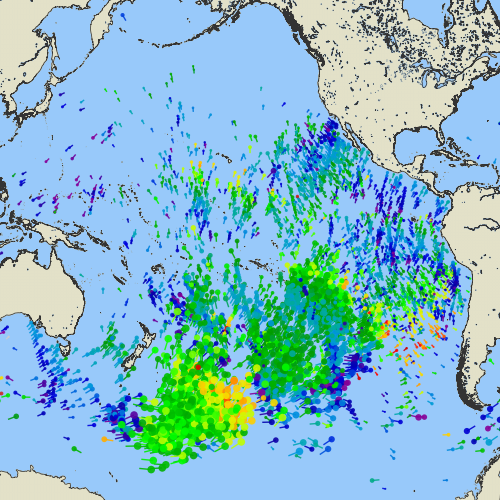 Ocean surface displacements measured by Radar satellite - Capturing large currents such as the Agulhas and the Gulf Stream. SHOC, standing for Satellite Hurricane Observation Campaign, is a campaign planned during the 2016 hurricane peak season (August and September) which aims at collecting observations over hurricanes in order to provide a synoptic view of hurricane development and evolution. Sentinel-1 data is the key resource of the SHOC experiment. 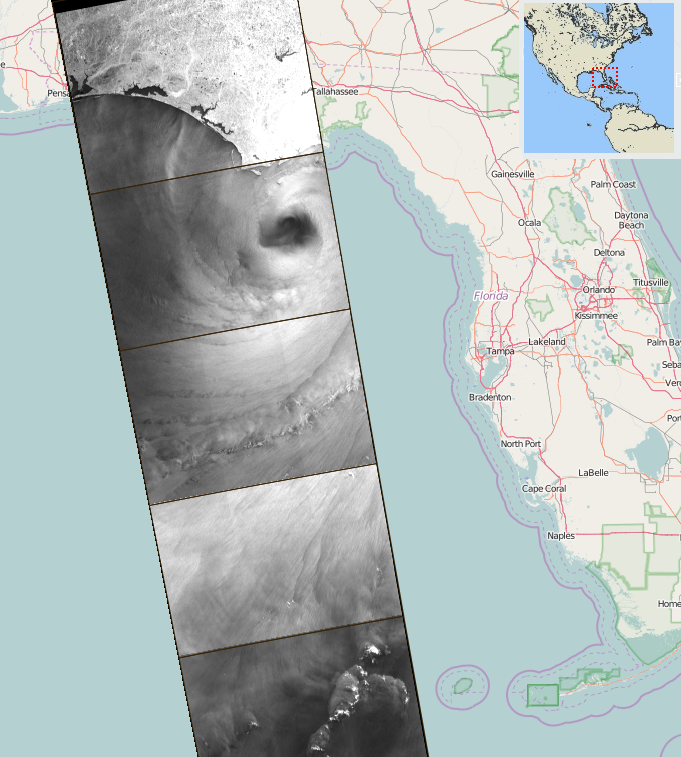 The main goal of this campaign is to acquire a maximum of Sentinel-1 products over hurricane eyes or edges, co-located with other data sources. One important constrain is to take benefit of the efforts done at NHC, the National Hurricane Center (USA), to collect measurements during air flights with both radiometers and drop-sounders. This leads us to focus the campaign on the Gulf of Mexico (GoM), and West North Atlantic, a place known for its strong tropical cyclone activity, particularly peaking in August/September. During this campaign, SHOC consortium will benefit from additional support from NOAA in distributing hurricane forecast track and from ESA S1 mission planning in enabling late programming acquisition over hurricane tracks. This study is funded by ESA through the Sentinel-1 Ocean study, within the framework of the SEOM program. Since years, CLS demonstrated the SAR capabilities to capture valuable information for marine applications covering environmental monitoring (wind, swell, and surface current measurements) and maritime security (oil spill, vessel, and iceberg detection, drifting…). The availability of SAR products from the Copernicus Sentinel-1 mission (with Sentinel-1 launched in April 2014) brings new opportunities to demonstrate the capabilities of SAR imagery to capture valuable information on a wider range of domains covering land, marine, atmosphere, emergency management and security applications. You will find here a subset of SAR products from the Copernicus Sentinel-1A spacecraft, collocated with auxiliary information and illustrating this wide range of applications. This subset will be complemented regularly with illustrations of new SAR products and derived information. CLS is continuously improving its tools in order to support new sources of information, enabling efficient collocation, inter-comparison and SAR products validation with other auxiliary products, and to derive new applications and services. Those tools are used for instance as a support to the Mission Performance Centre for the Copernicus Sentinel-1 mission (CLS being in charge of this service, with partners), responsible for calibration, validation, quality control and end-to-end system performance assessment. 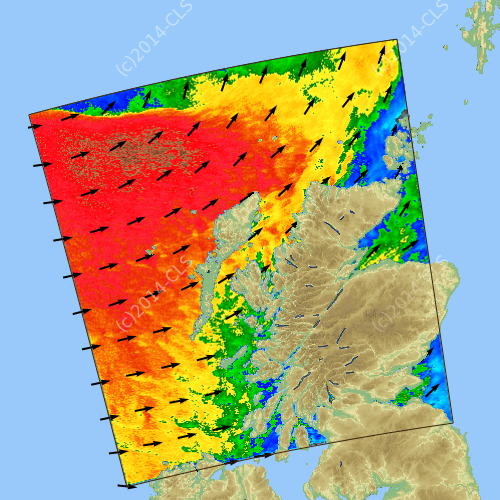 Ever since the launch of the Advanced SAR (ENVISAT/ASAR) by the European Spatial Agency (ESA) in 2002, CLS and ESA have made many efforts to demonstrate SAR capability to measure ocean surface wind fields from space at high resolution (up to 500 m). Delivering such measurements on a near real-time (NRT) operational basis can be very useful for meteorological services. As experienced by the Meteorological Service of Canada (MSC), such data can benefit to marine weather forecasting services and contribute to a better understanding of dynamic and thermodynamic atmospheric processes. In order to prepare the launch of the future SAR mission Sentinel-1 in 2014, a NRT delivery service of wind measurements extracted from the SAR instrument on-board RadarSat-2 is proposed. 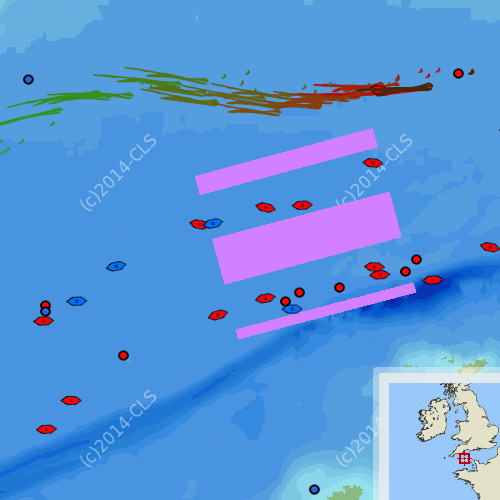 These 10-m ocean surface wind products are made available less than 10 minutes after acquisition at VIGISAT, the CLS operational reception center located in Brittany, France. This project is partially funded by the FUI (French acronym for Unique Interministerial Funds). It aims at promoting the use of added-value products acquired by Sentinel-1 to develop downstream applications. Ocean swells are fingerprints of the large ocean storms that generated them. They radiate away from them across ocean basins for thousands of kilometers. 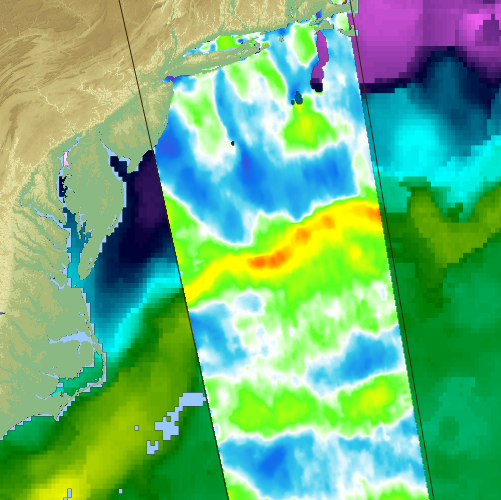 As these water surface oscillations propagate, they are imaged thanks to spaceborn observations given by Synthetic Aperture Radar (SAR), which is the only instrument able to provide worldwide independent directional swell spectra measurements. European satellites equipped with a SAR have been imaging ocean swell since 1992 with ERS-1, followed by ERS-2 in 1995, ENVISAT in 2002 and in the near future by Sentinel-1 in 2014. These instruments can operate in a specific “wave mode” sampling which provides swell spectra measurements every 100 km whenever flying over deep ocean regions. Using measurements acquired at different times and locations and a simple great-circle propagation model, the long waves that all originated from the same storm event can be combined into swell systems. Thereby, spaceborne observations provide a unique view of worldwide swell propagation for a better understanding of ocean surface processes. This swell monitoring system already proved beneficial to numerical wave models by improving their swell propagation parameterization and could also contribute to a better swell assimilation. This study is partially funded by the ANR (French acronym for French National Research Agency) and the FUI (French acronym for Unique Interministerial Funds). Ocean surface wind field can be measured at high resolution (up to 500 m) from space using Synthetic Aperture Radar (SAR). Since the launch of the Advanced SAR (ENVISAT/ASAR) by the European Spatial Agency (ESA) in 2002, many efforts involving CLS and ESA have been done to improve the quality of this measure and to demonstrate the capability of processing ground segment stations such as VIGISAT (CLS) to receive, process, archive and deliver good quality wind products to users in near real-time. On top of this and thanks to a long term partnership between ESA, IFREMER, RISOE/DTU Wind Energy and CLS, CLS has now a significant database of SAR products. 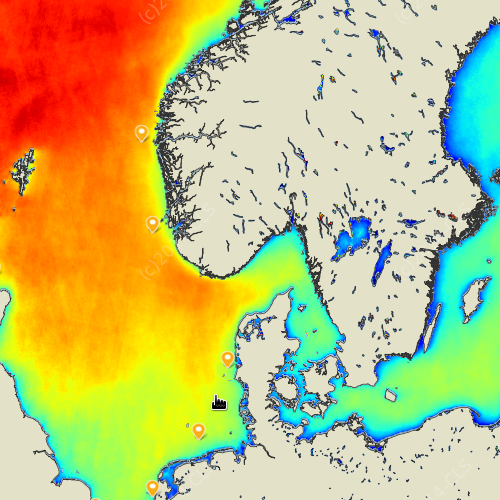 Based on this dataset, CLS and RISOE/DTU Wind Energy established a satellite-based wind atlas for the Northern European Seas. 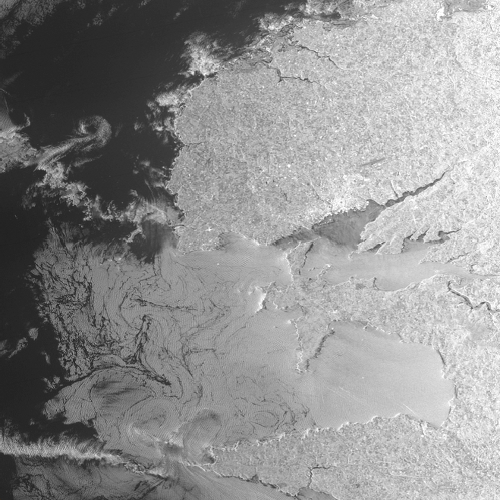 Their joint effort included the collection, processing, archiving and analysis of more than 9000 satellite scenes (Envisat ASAR WS) covering the Baltic Sea, Irish Sea and North Sea acquired between 2002 and 2012. Ocean surface wind fields have been calculated for each acquisition and maps of the wind energy statistical parameters have been derived from the data: mean wind speed, Weibull scale and shape parameters, energy density and uncertainty estimates. The number of overlapping scenes ranges from a few hundred in the Irish Sea to more than 1400 in parts of the North Sea and Baltic Sea. The more overlapping scenes, the less uncertainty is there in the resulting maps. Comparisons to offshore meteorological masts have been performed to discuss the ability of satellite data to statistically describe the wind energy. Results obtained from satellite data analysis are presented here as a demonstration of SAR capabilities for resource assessment in the field of offshore wind energy. Thanks to EODA tool, each SAR measurement used for this study can be collocated with ancillary data such as sea surface temperature, wind (NCEP/GFS model and ASCAT measurements), ice mask but also topography, bathymetry, EEZ, TSS etc to allow cross analysis. This study has been partially funded by ESA through several R&D projects (SOPRANO, Wind Waves and Current) and European Commission under Framework Program 7 (FP7) NORSEWIND project (TREN-FP7EN-219048). Ocean surface wind field can be measured at high resolution (up to 500 m) from space using Synthetic Aperture Radar (SAR). Since the launch of the Advanced SAR (ENVISAT/ASAR) by the European Spatial Agency (ESA) in 2002, many efforts involving CLS and ESA have been done to improve the quality of this measure and to demonstrate the capability of processing ground segment stations such as VIGISAT (CLS) to receive, process, archive and deliver good quality wind products to users in near real-time. On top of this, an thanks to a long term partnership between ESA, DTU Wind Energy and CLS, CLS has now a significant database of SAR products. CLS and DTU Wind Energy analyzed a large number of data to select cases where there is a clear reduction of wind downstream of wind farms (i.e. wind wake). This dataset allows characterizing the shape of the wake as well as the wind reduction intensity. They will serve as reference for comparison withe models in the framework of EERA-DTOC project. Results obtained from satellite data analysis are presented here as a demonstration of SAR capabilities for resource assessmentwake characterization in the field of offshore wind energy. This study has been partially funded by ESA through several R&D projects (SOPRANO, Wind Waves and Current) and European Commission under Framework Program 7 (FP7) EERA-DTOC project. Discharges of oil from ships and oil rigs cause significant damage to the marine environment. With the increase maritime traffic and oil drilling activities close to environmental sensitive areas, this is a growing concern. To minimize impact and damage to the coasts and the marine ecosystems, fast detection and efficient response from pollution control authorities are crucial. The use of satellite radar data has proven to be an efficient tool to assist national authorities in detecting potential oil slicks and locate polluters. Marine oil spills are known to have potentially significant impact on the marine environment and can severely affect wildlife. Chronic oil spills have caused the mortality of large numbers of sea birds when animals are concentrated in specific areas (e.g. wintering and breeding grounds or feeding zones). In the event of oil spill drifting toward a natural reserve, an alert is raised and sent to the appropriate end-users. Various areas of concentric circles (in drift time or distance) are defined accordingly. This demonstration represents the next generation service for satellite-based oil detection. The main users today include national pollution control authorities in Europe (now being served via the EMSA CleanSeaNet service), the offshore oil industry particularly in Northern Europe and a few other/commercial service brokers. Regional authorities and wildlife protection organizations are expected to be interested by such demonstration. This study is partially funded by the European Commission under Framework Program 7 (FP7) SEA-U project no. 263246. Since the launch of the Advanced Synthetic Aperture Radar (ENVISAT/ASAR) by the European Space Agency (ESA) in 2002, many efforts have been done to demonstrate the ability of such sensors to directly measure the ocean surface current from space at high resolution (10 km). Indeed the ocean surface displacements directly impact the Doppler signal measured by the radar. 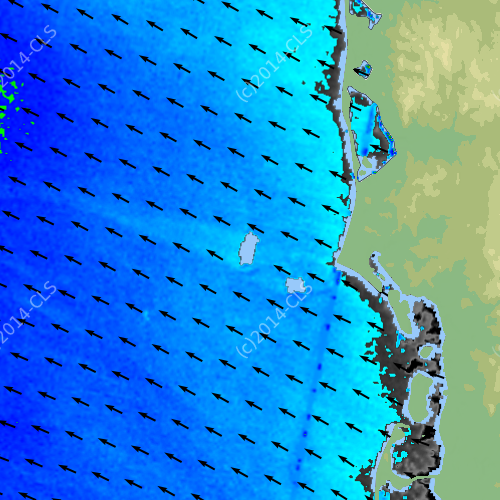 In this demonstration, all available data from the ENVISAT/ASAR ESA mission have been processed to produce radial velocities (ocean surface velocity projected onto the radar antenna radial axis) and wind maps for each acquisition. In addition, statistics deduced from this collection of data are presented. South Africa and the East coast of America have been selected for the presence of two strong and steady ocean surface currents (Agulhas current and Gulf Stream). These currents are following the shelf break until they emerge in the open ocean. In addition to these geophysical properties, their orientation with respect to the radar look angle is very well adapted to the demonstration. The Mediterranean Sea has been selected to investigate the possibility of measuring weaker ocean surface currents such as the Liguro-Provençal-Catalan Current or the western and eastern Alborán gyres. In addition, the Mediterranean Sea is also interesting to evaluate the relationship between Doppler and sea state (wind waves). Each SAR measurement can be collocated with ancillary geophysical data such as sea surface temperature, wind (NCEP/GFS model and ASCAT measurements), ice mask but also topography, bathymetry, EEZ, TSS etc to allow cross analysis. This study has been partially funded by ESA through several R&D projects (SOPRANO, Wind Waves and Current).